Fatal hepatic disease is closely related to non-alcoholic fatty liver disease, especially non-alcoholic steatohepatitis (NASH). NASH is associated with cardiovascular events because it develops on the background of lifestyle-related diseases. Chymase-dependent angiotensin II-forming activity (dAIIFA) in circulating mononuclear leucocytes (CML) is a marker of local angiotensin II production and inflammation. This study investigated the association between CML chymase dAIIFA and NASH. Cardiovascular outpatients were recruited and the Fib4 index (F4I) was calculated. Patients with an F4I > 2.67 were classified into the high F4I group and these patients were strongly suspected to have NASH, while patients with an F4I < 1.30 were classified into the low F4I group. Patient background factors were compared between these groups. CML chymase dAIIFA was measured by ELISA using Nma/Dnp-modified angiotensin I. Among 499 patients, 16% were classified into the high F4I group. 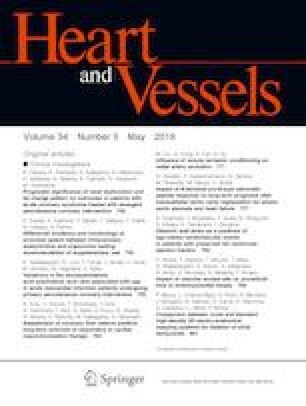 Compared with the low F4I group, the high F4I group had a significantly higher age, pancytopenia, more frequent diabetes mellitus, lower diastolic blood pressure, lower estimated glomerular filtration rate, higher brain natriuretic peptide, lower plasma aldosterone concentration, higher total AIIFA, higher CML chymase dAIIFA, and higher pulse wave velocity. Contrary to expectations, the body mass index, triglycerides, and low-density lipoprotein cholesterol were relatively low in the high F4I group. Many cardiovascular outpatients have a high F4I and can probably be categorized as NASH. The high F4I patients had few features of metabolic syndrome and were suspected to have elevated tissue chymase dAIIFA contributing to inflammation in the liver as well as in cardiovascular organs. We thank Mrs. Nao Totake and Mrs. Rieko Yoshida for their excellent technical assistance. This work was supported by JSPS KAKENHI (Grants No. 21590916 and No. 26461118).